Pope Francis has attacked the â€œdictatorshipâ€� of the global financial system and warned that the â€œcult of moneyâ€� was making life a misery for millions. He said free-market capitalism had created a â€œtyrannyâ€� and that human beings were being judged purely by their ability to consume goods. Money should be made to â€œserveâ€� people, not to â€œruleâ€� them, he said, calling for a more ethical financial system and curbs on financial speculation. Countries should impose more control over their economies and not allow â€œabsolute autonomyâ€�, in order to provide â€œfor the common goodâ€�. The gap between rich and poor was growing and the â€œjoy of lifeâ€� was diminishing in many developed countries, the Argentinian Pope said, two months after he was elected as the successor to Benedict XVI. â€œWhile the income of a minority is increasing exponentially, that of the majority is crumbling,â€� said Francis, who as archbishop of Buenos Aires visited slums, opted to live in a modest flat rather than an opulent Church residence and went to work by bus. "most gold discovered throughout history is still in circulation"
So where is 100,000 TONS of GOLD? World Gold Reserves: Notice ONLY 30-40,000 TONS! 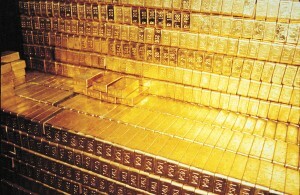 It has been estimated that all the gold mined by the end of 2011 totalled 171,300 tonnes. At a price of US$1500 per troy ounce, reached on 12 April 2013, one tonne of gold has a value of approximately US$48.2 million.